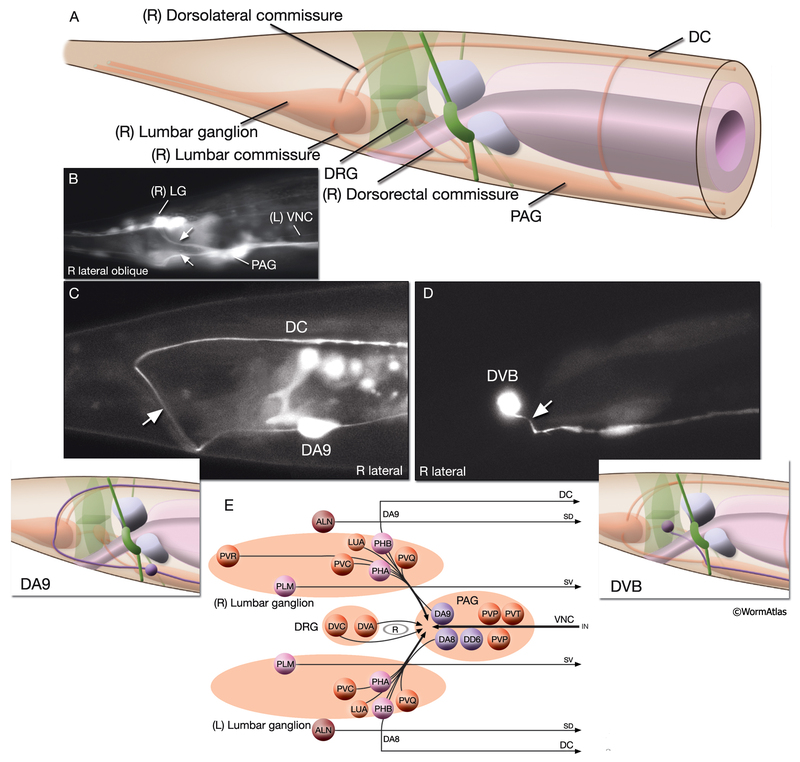 NeuroFIG 18: Commissures in the tail. Anterior is to the right in all images. A. The two lumbar ganglia are connected to the preanal ganglion (PAG) by lumbar commissures on the ventral side and to the DC by dorsolateral commissures on the dorsal side. The three dorsorectal ganglion neurons grow their processes ventrally toward the PAG via the left- and right-side dorsorectal commissures. C. DA9, a VNC motor neuron situated in the PAG, sends its posteriorly directed process to the DC via lumbar and dorsolateral commissures (arrow). Epifluorescent image from a transgenic animal expressing the itr1pB::GFP reporter gene, right lateral view. Magnification, 600x. (Strain source: H. Baylis and N. Gower.) (Left inset) Graphic rendition of the same neuron. D. DVB is located in the DRG and sends its process to the PAG via a left-sided dorsorectal commissure (arrow). Epifluorescent image from a transgenic animal expressing unc-47delta::GFP, right lateral view. Magnification, 600x. (Strain source: Y. Jin and O. Hobert.) (Right inset) Schematic rendition of the same neuron.